I may create more visions, so keep an eye out! I can’t wait to see what other people come up with. I don’t have much to say. Pretty much just spamming your inboxes and feeds because I started this weekly thing and feel compelled to see it through. Last class was great. Thanks for the pizza, Art! I added one reading to the syllabus, and I clarified that you only have to watch the talk part of my talk. Though the Q&A is pretty good, especially Berkman founder Charlie Nesson’s comments at the end. I also removed the peer review of the rubric updates. The teaching team will take a look at them, and I’m satisfied by the conversations we are having in update groups. There are fewer posted office hours, but you should feel free to email me or the teaching fellows if you need someone to lend an ear. freshcognate: doesn’t bundling protect values created from institutions that are widely believed but difficult 2 quantify? 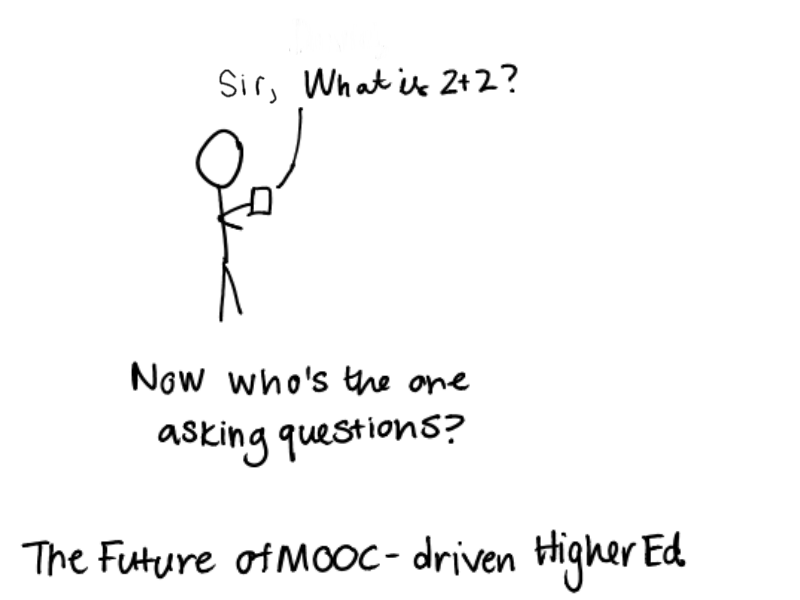 plawless2450: Amazing (and entertaining) insight from , Sanjay Sarma, and Peter Bol on the future of MOOCs. Thank you ! Also, as an experiment, I’m going to ask that people put away laptops and devices during the panel. It make for an unfriendly view from the dais. If a couple students want to volunteer to take notes to share, that’s fine. Readings- I added Anant’s TED talk to the syllabus. Survey– If you haven’t yet, please take the mid-course survey. Final Project Description Rubric- For Wednesday, please resubmit your updates project description and rubric in the Canvas assignment under Week 8. Simply revise your draft with new rubric criteria, new expectations, and an update on your progress. Project Updates– This week and next, for lab/section time, we’ll break into groups and discuss project updates. If you can bring something “prototype-y” to show people. An outline, a wire frame, a rough cut, a draft, that will enrich the conversation. That’s all for now. If you have questions, let me know. Colleagues, I’d welcome your feedback on how class is going so far and what we can do better to improve our shared learning experience for the second half. Please complete this anonymous survey to share your ideas. Thanks for the rich discussions last week in class. Blended learning proved to be a good way to weave together a number of themes that we’ve discussed to this point. I’ve uploaded Julia’s slides and your various discussion group notes to the syllabus. On the social front: many of you may be away for Columbus day, but this weekend is one of my favorite Cambridge events: Honk! Festival of Activist Street Bands. Brass bands from around North America, come to Davis Square on Saturday and then have a parade to Harvard Square on Sunday. In past years, it has been super fun. If you see me dragging around two little girls, please say hello. We’ll be learning from folks at HarvardX and MITx about how software platforms and online courses are produced, and for those that are interested, we’ll do a brief after hours tour of HarvardX offices and studio. Readings are modest, so I hope folks take the opportunity to make substantial progress on your projects. I’d encourage you to post an update to cement your thinking, and on 10/22 and 10/29 we’ll spend some class time in small groups discussing our progress. The more concrete work you can share, the more valuable that time will be. As always, I’m grateful to you all for your insights, our conversation, and all that I’m learning with you.